With all the buzz about the increasing health benefits of dark chocolate recently, it’s only natural that the big guys cash in on the trend. Mars, which owns the fast growing brand Dove, has released new bars that cover the dark chocolate and single origin trends. A few things to note before I move onto how they taste. 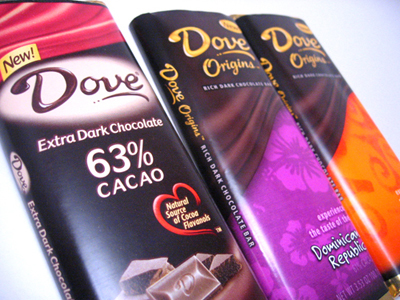 Firstly, in order for a chocolate to be called “dark” here in the United States, it has to have at least 35% cocoa solids. So, as Dove sees it, if 35% is dark then 63% must be extra dark. I wonder who they think they’re fooling. Secondly, the “single origin” beans they’re using come from the Forastero cacao bean. Forastero is the least flavorful cacao bean there is and it’s used more for bulk processing of chocolate. So right away, I’m skeptical of this line of chocolate. Now, all my chocolate snobbery aside, I actually was pleased with this chocolate. Even though it’s nothing to compare to Guittard, El Rey, Valrhona, etc., it still stands on its own as a chocolate for the general public. Ghana tasted the best of the three I sampled with a nice rich chocolaty flavor and a smooth mouth feel. Dominican Republic was a little more waxy with a burnt flavor to it. The 63% was my least favorite with a slippery texture and muddled flavor. The sugar content in these is on the large size for dark chocolate and the sweetness of these three are pretty on par with other standard American chocolate bars. I found these to be very tricky in terms of their place amongst other chocolate bars. They may not be the highest quality chocolate on the market, but for the budget and novice chocolate lover they provide a good starting place. You also can’t look past the fact that they’re introducing the idea of single origin to the masses and that awareness is an asset to the industry. Thanks for the review, very helpful, I won’t buy these now! I guess they’re fooling me. If 35% is dark, why couldn’t you call 63% extra dark? Slightly off-topic, I am not a native English speaker, is ‘cacao’ a word in English? I thought it was ‘cocoa’. Alex, most chocolate connesseurs call dark chocolate only if it’s at least 70% cocoa solids and contains no milk products. Dove has been guilty of the latter too. Sera, thanks. It’s a bit confusing because in Dutch we call cocoa cacao. And I guess we call cacao cacao too. Don’t think I’ll try the bars, if they even come to Holland.